A Bluetooth speaker and a roasting thermometer have been ingeniously combined for kitchen-based musical accompaniment. 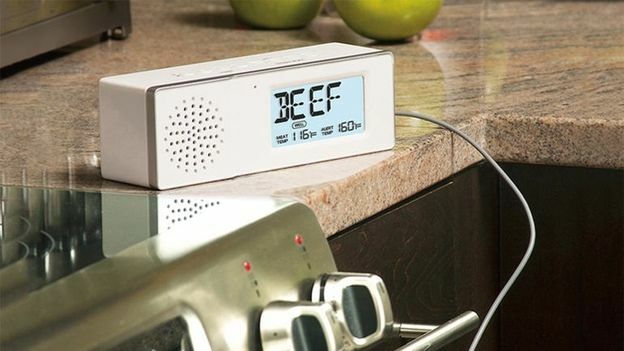 While it might not seem the most obvious combination, Maverick Chef has crossbred a Bluetooth speaker with a typical roasting thermometer. The rechargeable speaker, like others of its kind, will connect to your smartphone or tablet and, if hooked up to the former, will also act as a speakerphone. It's party trick is that it also comes with a thermometer built-in that'll keep track of the temperature of your roast. Stick the probe into whatever culinary masterpiece you're cooking up and it'll issue a voice alert so you know when it hits the right temperature. Currently on sale at $150 (£88) in the States, it's unclear whether the originally-named Maverick Chef Tunes Bluetooth Kitchen Speaker & Roasting Thermometer will be making it over here to Blighty.